Made in the USA from top quality outdoor fabrics. 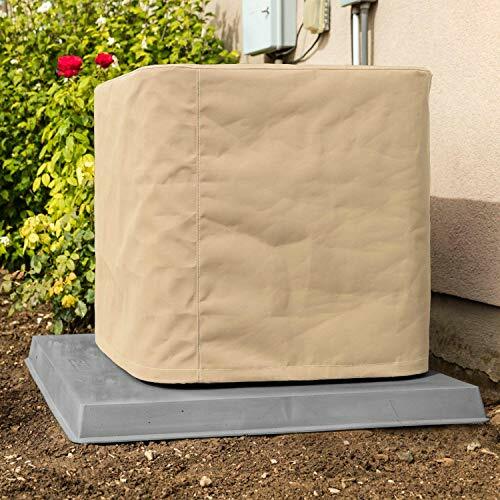 Protect your cooling unit during the off-season from dirt, debris, snow, ice and UV rays. We only use breathable canvas which allows air to circulate and prevents harmful condensation. Includes corner opening to accommodate any wires, pipes or hoses. A draw-rope is sewn into the bottom to cinch the cover up tight. **We are the manufacturer! We've been making custom canvas products right here in the USA since 1941. We know you'll love our product so we back it with a 100% satisfaction guarantee. If you don't love your cover you can simply return it within 60 days for a full refund, minus shipping & handling. **Premium Marine canvas covers come with a 5-year limited warranty. If your cover becomes unserviceable during the warranty period, simply send it back and we will repair or replace it, at our discretion. See Warranty information for additional details. If you have any questions about this product by SugarHouse Custom Covers, contact us by completing and submitting the form below. If you are looking for a specif part number, please include it with your message.